Last night, the Supreme Court shocked many of us when it took the unprecedented step of granting a stay of the EPA’s carbon-reducing Clean Power Plan before litigation against the rule has even been heard by the D.C. Circuit Court of Appeals. A stay is essentially a judicial pause button that halts the implementation of a regulation while challenges to it work their way through the court system. In doing so, the Supreme Court overruled the D.C. Circuit Court’s decision to deny the request for a stay, apparently agreeing with the rule challengers that they would suffer “irreparable harm” if implementation of the Clean Power Plan were allowed to go forward while the litigation was underway. What that harm actually is remains unclear. Countless studies, including several from Synapse, have shown that modest clean energy and conservation measures would not only help us meet the Clean Power Plan’s goals but would also reduce other forms of harmful pollution (such as soot, mercury, and acid rain), save consumers money on their energy bills, and boost state economies through increased innovation and job creation. Furthermore, these cost-effective measures are already being implemented in many states, even without the Clean Power Plan. The minimal effort required of each state to implement a plan to comply with the Clean Power Plan will be dwarfed by the tremendous benefits a state’s residents could realize as a result of cleaner, cheaper energy and a healthier environment. In the meantime, we must wait while petitioners move through the courts. Thankfully, when the D.C. Circuit Court originally denied the request for a stay, it set an expedited hearing schedule. This means the case will be heard on June 2nd and a decision could follow as early as the end of summer. The parties that lose this case can either appeal directly to the Supreme Court or request an en banc rehearing in which all nine judges on the D.C. Circuit agree to rehear the case. This decision can then be appealed to the Supreme Court, which will grant certiorari if it is willing to hear the case. Depending on how quickly the litigation moves at the D.C. 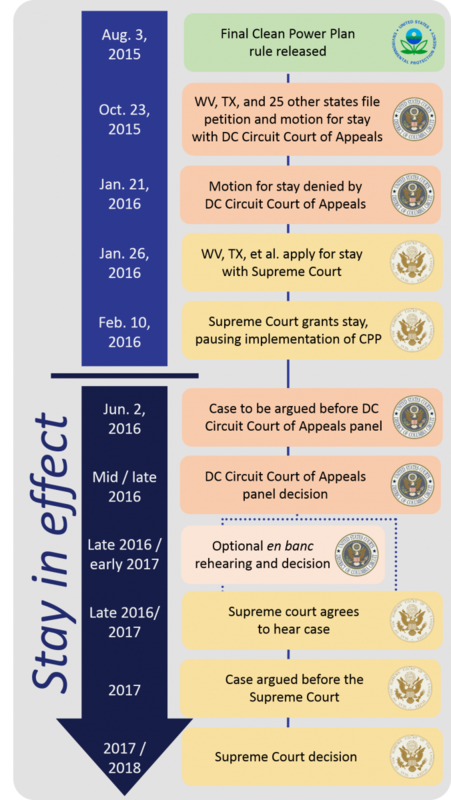 Circuit Court, a Supreme Court case could be heard and decided during the Supreme Court’s next nine month term, which begins this October. Or it could drag on for several years. What does this mean for our larger climate goals? Obviously, any lengthy delays will make it that much harder to continue making progress toward our long-term climate objectives. The Clean Power Plan aims to reduce carbon dioxide emissions from existing fossil fuel-fired power plants by 30 percent from 2005 levels by 2030—still a far cry from what is needed to meet our commitments under the Paris Climate Accord to keep global warming at or below 2 degrees Celsius. The clock is ticking for the United States—still one of the largest emitters of greenhouse gases in the world—to make good on our promise to reduce our contribution to global climate change.